Just as I think of Scott Kim when I think of symmetries, I cannot help thinking of Maurits Cornelius Escher when I think of tessellations. His artistic tessellations make the concept ‘come to life.’ I like the way that he plays with shapes and meaning … and I hope you do, too! 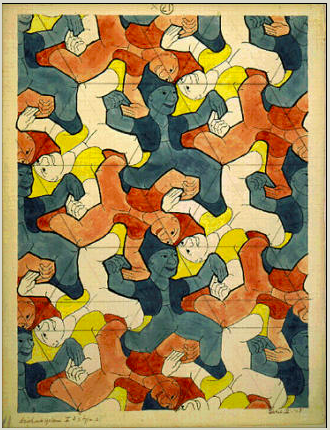 This image is called Clowns, but he produced many tessellations and other mathematical images as well. Please visit the official M C Escher website which has been set up to preserve and display his work. There you will be able to learn about the man and view many of his wonderful artistic creations. Please note that all Escher’s works are still copyright and the copyright is owned by The M.C. Escher Company, B.V. which operates the official website. They have kindly granted me permission to use this image. A shape that is tessellated is one that can cover a plane in an interlocking way with no gaps. Sometimes there are two shapes, or three that tessellate together, and Escher explored all these possibilities. You will notice that Clowns has been based on equilateral triangles (since Escher did not erase his construction lines). Equilateral triangles tessellate, of course, since they can easily cover a plane with no gaps. There are other shapes … squares for example … that tessellate, but can you think of others? Try joining squares together into units. For example, three squares can form a V shape which tessellates. What about four squares producing an L shape? Does that tessellate? You might experiment with equilateral triangles as well. Once you have a basic tessellating shape, you can begin to distort it in different ways and that is where the creativity comes into play as well. I will be adding material here to give you ideas about how to explore the mathematics of tessellations … and how to create some of your own!